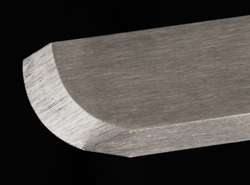 Richard uses skews with a curved edge. This facilitates making cuts easier than with the traditional straight edge skew chisel. The tool length of these skews is about 7" with the thickness ranging from 3/16" to 5/16". The Radius Skews come fitted with 9-1/2" handles.